Plantain and Banana is very easy to cultivate and maintain unlike other cash crops. And it’s a low capital requirement farming business. Most Loamy soils in the is good for the plant as experience has shown. Therefore, if you have any land with loamy soil, you are good to go. Plantains and Bananas are a staple food in the tropical regions of the world, the tenth most important staple food that feeds the world. They are treated in much the same way as potatoes and with a similar neutral flavor and texture when the unripe fruit is cooked by steaming, boiling or frying. Plantains and Bananas fruit all year round, which makes the crop more reliable all-season staple food, particularly in developing countries like Nigeria, Ivory Coast, Togo, Liberia with inadequate food storage, preservation and transportation technologies. In Africa, plantains and bananas provide more than 25 percent of the carbohydrate requirements for over 70 million people. plantains, thrive in tropical regions. Warm temperatures, bright sun and adequate moisture create optimum growing environments. 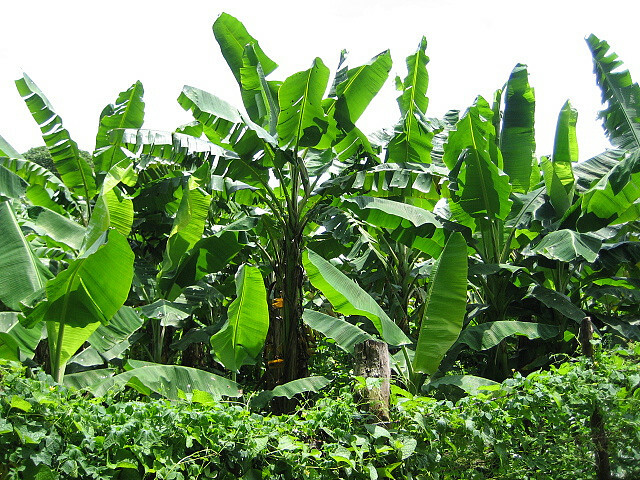 Tropical soils, however, are not always suitable for plantain production. 1. Land with good soil - Loamy soils are the best producing soils because they contain a good organic to inorganic ratio. Organic materials, such as decaying plants and insects, provide soil with air, nutrients and water-retaining matter. This combination of ingredients, when combined with mineral particles, allows soil to remain loose and fertile. In tropical rain forests part of Nigeria, organically rich soils are shallow. Plantains will thrive for one to three years but then die back because the layer of organic matter is easily depleted. To avoid depletion, it is necessary to provide soils with compost and mulch. 2. Prepare the soil – Clear the land and cut some of the trees if any, Plantain plants also grow best in bunches or groups because they protect each other from the harsh rays of the sun. It is important to create an environment where the plantain plants are sheltered either because they are bunched up together or there are other trees to protect them. It is important to maintain the humidity of the plantain plantation by allowing some of the trees to remain for the purpose of protecting the plant from excessive sun and to enhance the humidity. 3. Get the plantain suckers - Considering that a plantain plant is not a tree but a type of herb, they cannot actually be grown from seeds like most trees. Plantain plants are grown through suckers. Suckers are those that grow from a dying, mature plantain plant that can be transplanted and re-grown. They may be considered as baby plants that are used to start new plantain plants. Choose suckers from plants that are vigorous. They should have small, spear shaped leaves and are about four feet high. There is a corm at the bottom of each mature plantain tree. In transplanting a sucker, it is necessary to cut downwards and get as much corm and root as possible. Plant these and cut or decapitate the sucker to facilitate good evaporation.
. In the early days of your plant, keep them moist but not too wet as they don’t have leaves yet to evaporate the water. 4. Control the weeds – The weeds control is very important if you want your plantain to do well, the cost of weed management could account for up to. 45% of the total cost of plantain plantation management in Nigeria. Use traditional weed control of employing laborer to do the weed cutting. As the plantain grows, it is important to protect it from strong winds. It is also important to keep it well watered. One can also sprinkle fertilizers every now and then but mostly throwing the plantain dead leaves back into the plant is enough to sustain the rich quality of the soil. Unlike other trees, plantain do not need complicated pruning. Just remove dead leaves and dead plants near the plantain. Also remove suckers from the plant keeping only one or two that have spear shaped leaves. If you must use a fertilizer, Use an NPK fertilizer, or a fertilizer mixed with nitrogen, potassium and phosphorous. Fertilizing the plantains once a month will stimulate growth. The fertilizer should be placed evenly in a circle that is four to eight feet from the trunk. Within 8-10months your plantain should be ready to produce, and as one is getting matured for harvest, another one is replacing it, they continue in that circle removing any stress expenses of planting again. All you do is to harvest and reap your profits all year round. The same thing apply to Banana. If you are looking for long term, you may consider Palm, Cashew, Green Peas, and other cash crops. If you are looking at short terms, you need to look at Vegetables (Carrot, Okra, Green beans, Cucumber,) or other Crops like Cassava, Rice, Beans, Soybeans.